Lineup - Vijay Iyer: piano; Graham Haynes - trumpet, cornet; Steve Lehman: alto saxophone; Mark Shim: tenor saxophone; Stephan Crump: bass; Tyshawn Sorey: drums. Vijay Iyer is a tour-de-force pianist, improviser, and composer whose innovative concepts about music got him a wide legion of jazz fans. To materialize the ten new original compositions included on Far From Over, his fifth ECM album, he opted to trust his recurrent rhythmic partners Stephan Crump and Tyshawn Sorey, respectively bassist and drummer, and enlisted the resourceful saxophonists Steve Lehman and Mark Shim, as well as the trumpeter Graham Haynes for a spectacular frontline. The introductory section of “Poles” is launched with solo piano, to which bass and drums join before the luxuriant entrance of the reedists, who infuse striking counterpoint to the already bombastic groovy flow. Iyer’s incisive comping and rhythmical expression work in synergistic communion with Crump and Sorey, who respond with sturdiness to Lehman’s pungent language full of steep accentuations. In opposition to the altoist, Haynes, less adrenalized and more embraceable, contemplates with pleasure first and then explores before wrapping up. Both the grandiose title track and the pushful “Good On the Ground” gallop energetically by employing vigorous rhythms. While the former, dishing out majestic polyphonies over a beautiful textural matrix, gives the opportunity to the horn players to shine individually and collectively, the latter, seems to have been made for an action movie with heart and bravery as key factors. It eventually glides into jazzy ground to sustain Shim’s infectious phrasing, Iyer’s extemporaneous runs and mordacious note aggregations, and Sorey’s powerful rhythmic cramps. A fluid post-bop interpretation suffused with an impeccable rhythmic sense defines “Down to the Wire”, which features Shim’s dark timbre and impressive power of argumentation. Crump and Sorey, always working side by side for a steadfast navigation, weave a ductile layer that serves Iyer’s flexible ideas. Eloquent and adjustable, the pianist excels in his vibrant attacks. Airing danceable and unambiguous vibes, “Into Action” serves as a vehicle for Haynes and the bandleader extemporize their creative thoughts. Even if we find some rhythmic connotations with “Nope”, an urban jazz-funk piece where Iyer adventures himself on the Fender Rhodes, this tune stands on a completely different shelf. Quieter moods may be enjoyed not only on “For Amiri Baraka”, a poetic stance that expands harmonically in a classic trio format, but also on “Wake”, whose innocuous movements convey the lethargy of awakening from a heavy sleep, and “Threnody”, where the initial cerebral serenity is shaken by Lehman’s cutting-edge expansiveness. Far From Over propagates revolutionary sound waves with the visceral earnestness that has been always associated with the pianist’s work along all these years. 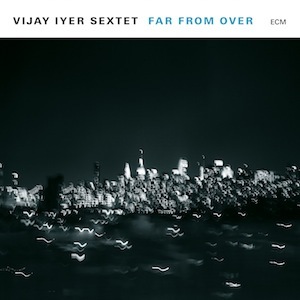 Vijay Iyer's compositional style translates into a vortex of possibilities in terms of rhythmic intensity, challenging time signatures, and interactive action, which are all unmistakable features of this authentic and consummate jazz artist.